CATHARSIS: Catholicism and My Catholic Self: Who's Rejecting Whom? Catholicism and My Catholic Self: Who's Rejecting Whom? This is one term I never imagined would describe me but apparently it does. Well at least that’s how my religion defines me. I’m a baptized Catholic, raised and socialized as one, and currently (semi) practicing as well. But recent events have forced me to reassess that self-definition and are truly forcing me to question how much of a Catholic I still am. If you live in the U.S., you have probably heard on the news that an Indiana woman was fired from the Catholic school she was teaching at, all because they found out that she underwent IVF. This news bothers me on so many levels, but one that I find even more striking is that the pastor who fired the teacher told her that she should just have kept mum about her IVF treatment so as to avoid a scandal. So, is she really being fired because of her choice to do IVF to which the Catholic Church is strongly opposed, or is it because of her admission and putting it out in the open? If she had kept it secret, would it have been more acceptable? Isn’t that quite like saying that a ‘sin’ does not exist if others don’t know about it? On another level, is IVF really so taboo that one should not be allowed to discuss it in the open? Is it really a ‘sin’? Well it is, according to Catholicism. In the mid-‘80s, I remember being taught in elementary school that IVF is unacceptable, immoral, and therefore one sure path to mortal sin. During that time, there was one popular Filipino actress who admitted that she had tried that route in order to conceive. She was discussed in class as an example of someone ‘immoral’, sentenced to eternal damnation for committing mortal sin. Little did I know then that I’m one with blocked tubes, reproductively challenged, and would have a difficult time conceiving naturally, if at all possible. I now apologize for all the judgment I felt towards that actress. I did not know any better. The Catholic Church, in its document Donum Vitae of 1987 which outlines the church’s stance on respecting the origin of human life and preservation of the dignity of procreation, prescribes that conception/procreation be tied to marriage; that fertilization is only acceptable if it is the result of an act of conjugal union and love. Furthermore, the document states that any type of conception that is not the result of a conjugal act deprives the resulting human life of ‘its proper perfection’. One other noteworthy point from the Donum Vitae is that it clearly states that marriage does not give couples the right to a child, because giving spouses that right robs the child of its rights and objectifies that child, as if it were some form of ownership. Such is said to contradict the belief that children need to be viewed as the ‘supreme gift, a living testimony of the mutual giving of his parents’. Now don’t get me wrong. I agree that human life is sacred and should be respected and preserved. It is in this light that I remain conflicted with the common IVF practice of discarding embryos. In a way, I feel lucky that I did not ovulate as much as other women do; that to begin with, I never produced a lot of eggs for the fertilization process, and that for the ones that were fertilized, only three were completely viable enough to be transferred back to my womb. That is true for both IVF attempts I’ve gone through. In other words, there were no extra embryos for us to freeze and later dispose of. 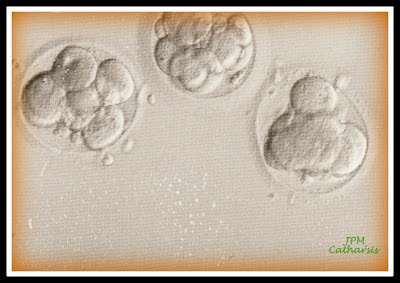 However, I did have those extra embryos that were not viable and therefore did not survive on their own in a Petri dish and eventually had to be naturally discarded. For that, I will always bear the burden of guilt and suffer whatever consequences there may be. However, I reject the idea that the manner in which my son’s life began is labeled unacceptable by any religion, or person because they think it is not borne out of love. That would be terribly unfair and uninformed. Choosing IVF was a joint decision, and my husband and I knew how difficult the journey would be, both physically AND emotionally, and decided to support each other through it all. Once you start on this process, you know there are no guarantees, and though you know what sacrifices it would entail, you just keep reminding yourself of the possibility of a priceless gain and truly just hope for the best. If you don’t think this all requires love and commitment, then I don’t know what else to tell you. I also find it abhorrent that my religion believes that I denied my son his ‘proper perfection’ just because he is a product of IVF. How dare they say that he, or any life born, is less than perfect? Who are you to say that? Did God not have any hand in my child's coming to life? Yes, science helped me get pregnant, but science does not guarantee the survival of all embryos transferred to the womb. Even my fertility doctor then said, "That's as far as I can go. The rest is still up to God." I have countless sins and you can call me immoral based on other things I’ve done in my life if you so wish, but I refuse to be judged this way based solely on how I had my son whom I love with all that I have, and more. It simply would not, and does not, make sense to me. And if the Catholic Church still wants to call me immoral, then so be it. Their label does not have to be mine. If that is the case, then I'm brought back to the question I asked in the beginning of this post: How much of a Catholic am I still? More importantly, how much does that still matter to me? I am struggling with these questions and I suspect I will continue to do so for a very long time. All I know is that I refuse to believe that the God I want to believe in is narrow-minded and discriminatory. I can debate this issue for days but it won’t change the fact that religion is just that…an expression of belief systems, a man-made institution. I will never take it as something infallible or perfect. When I was younger, I used to say that if you don’t want to feel my wrath, you should never insult four things about me: my family, my alma mater, my nation, my religion. I guess I grew up and realized that always speaking in absolutes is not a very intelligent thing to do. Identity claims do change. And right now, one of mine is, (or has been), in limbo.